Watch: 83-year-old Irish granny pull off epic bottle flip then Dab!! Home Entertainment 83-year-old Irish granny pulls off epic bottle flip then Dabs!! If you ask me the this latest craze of “bottle flipping” is just another way for kids to annoy parents. But bottle flipping — promoted through online videos to toss a partly filled plastic bottle and try to have it land upright — has captivated kids around the world. It now also seems to have captivated grannies..at least in Ireland anyway. IRISH grannies might not be known for their dexterity, but one Dublin grandmother’s skills prove otherwise. Chris Delaney, 83, showed that she’d lost none of her hand-eye-coordination when she pulled off an epic double bottle flick in her kitchen. The bottle-flipping craze took off this year after an American High School student was filmed executing a nifty flick of a water bottle. But Mrs. Delaney’s effort was even better. 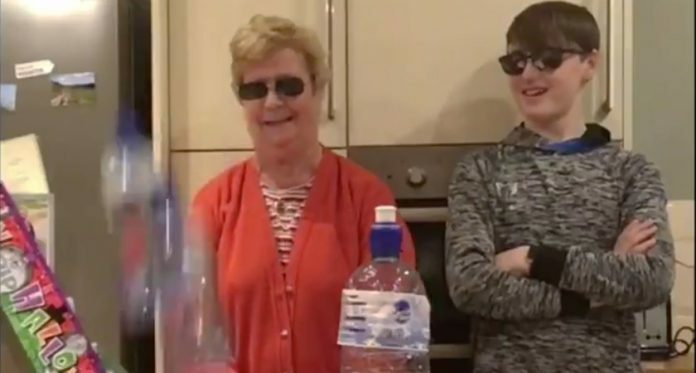 After her Wexford-based grandson Fionn, 13, triumphed with a deftly executed single bottle flip, nanny Delaney stepped up and did one better with two at once.